Our stop in Tallinn was at a social service centre in the middle of one of the older large scale social housing units in Tallinn. There was a great attendance from the local community and from other associations from the area. We were welcomed by the Deputy Mayor of Tallinn, Mr Tõnis Mölder. 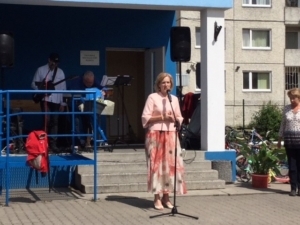 After this we had a welcome concert from well-known singer Anne Veski and other well-known Estonian performers. 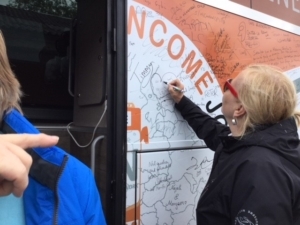 Then there was the opportunity to present the #eminbus and there was great enthusiasm for signing the bus and the petition. We then had the opportunity to engage in conversations with the local people, many of whom are first language Russian speakers. The people I spoke with stressed that one of the good things of living in Tallinn as that there were mostly good interactions between the different communities. They said they would like to see more mixing in schools. A key issue that emerged was that the minimum wage while having some safe guards for people in full-time employment, was not working for those in part-time or more precarious employment. The difficulties from low pensions and low minimum incomes were also stressed, for example it was said that often they could not send their children to the extra activities organised for the children by the schools. Access to services and particularly health care was also highlighted. There was an opportunity to present some of these concerns to the Minister of Social Protection, Mrs Kaia Iva, as she attended the event and addressed all who were gathered there. She stressed the importance of constructive critical engagement and the aspirations of the government to make progress in tackling poverty. She also asked that we send a message of how unacceptable it is that in some countries (she mentioned Denmark and UK) that proposals are made which would discriminate against Estonians entitled to social assistance. What emerged from our visit to this area was the need to really say what we mean by living in dignity? What would be adequate to live in dignity?. It is important we get beyond approaches that are just about survival support but really invest with amounts that not only helps people to survive but also to thrive. Leaving Estonia on the ferry to Finland, I had the impression that our Estonian colleagues were advancing this message about guaranteeing the right to live in dignity. The amount of media coverage of the bus visit was impressive. I hope our time in the country gave some courage to continue their great work and may be brought some new champions for their message.